In preparation for the big event of this summer, the Clan Mac Datho now has a brand new line of apparel. Christiaan Tulleners from Manatee did a fantastic job designing a Jersey, Hoodie and Zipped Hoodie that put the Clan on par with the most prestigious teams worldwide. Go visit the Manatee Team Store and get your goodies. 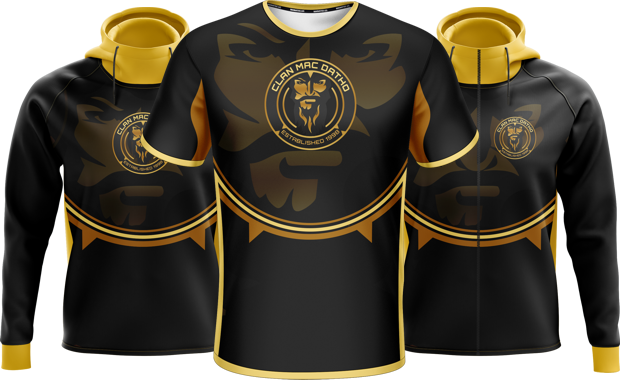 You will find your Clan Mac Datho e-sports Jersey and its alternate design, the hoodie and the zipped hoodie. Many more to come soon! 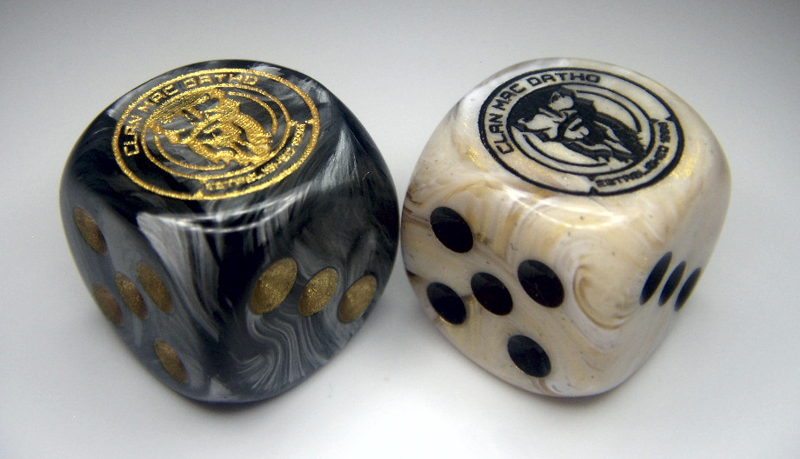 The Clan Mac Datho has teamed with Chessex, makers of the The coolest dice on the planet to produce two limited series customized for the Clan. Without being cheesy, these are really the world's best D6 gaming dice. Please contact us if you're interested. The Clan Mac Datho has a new logo, reflecting the spirit of the Clan, but in line with the aesthetics of today's gaming world. Thanks Spencer Wade from IVGrafix for the design! Call to Arms: The Clan Mac Datho will celebrate its 20 years in online gaming this year. Join the feast this summer in our homeworld (Strasbourg, France). Details will follow! There we go, the Clan Mac Datho is the 11th Guild created on Hydra. As usual, we'll make enemies (some already identified), but that ain't going to scare us! Cybertopia Studios just announced a new server for Astro Empires due to open on September 24. The Clan Mac Datho has already packed their bags and initiated their transfer on this server. Hydra will be based in North America, and will run version 2.0 of the game. We'll see you there on 24 September 2016, 5PM (GMT+1), join us! That's it, the Clan Mac Datho is back in business: It is very likely that we make our apparition in an online platform in the coming weeks. Don't forget as well that we're still present on Lord of the Rings Online (on Sirannon). Our Live Action Role Play section might also reopen under the expert supervision of Kornelius Mac Datho, so stay tuned for more news!